5 Years Parts 2 Years Labour Guarantee. With 5 cooking zones and 9 power levels , you're provided with precise temperature control , enabling you to cook your food to perfection. 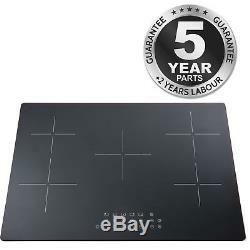 If you're looking for a hob that can provide you with. Then this hob is for you. This SIA R10 ceramic hob provides you with the flexibility you need when designing your kitchen to ensure you can reach new culinary heights. And it doesn't stop there.. With the safety lock activated , all buttons on the control panels will be disabled (except the on/off button), giving you peace of mind when the children are in the kitchen. If one or more of the cooking zones are accidently left on, the automatic switch off mechanism will activate after a certain period of time, and.. The residual heat indicators inform you when your hob is safe to touch. All of the above features are sure to provide you with the performance you can depend on year after year! To seal the deal, we have included a. 5 year parts and 2 year labour guarantee. Front controls Black glass easy clean surface Touch control 9 sensors Red Neons 5 cooking zones 0-99 minute digital timer Child lock function Residual heat indicator Automatic shut off mechanism. Front left zone highlight 180 / 1.8kW Rear left zone highlight 145 / 1.2kW Rear right zone highlight 180 / 1.8kW Front right zone highlight 145 / 1.2kW. Middle centre zone highlight 180 / 1.7/0.7kW. 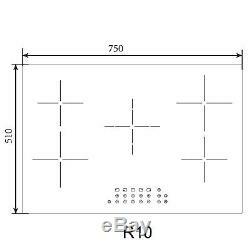 Product dimensions L 750mm x W 510mm x H 80mm Cut out dimensions W 490mm x L 735mm. We are committed to providing the highest level of customer service available, however should you not be 100% satisfied with the goods you receive please refer to the following below. All goods should be received back in our office within 14 days of receipt of goods. Please note that this does not affect your Statutory Rights under the Sales of Goods Act 1979. All goods should be checked within 24 hours against damage in transit. Failure to report this to us within this time frame will make any claims void. Once the return of an item has been confirmed with ourselves, the return has to be completed within 14 days. To speed up the identification of your return, we require your full name and order number to be clearly highlighted on the outside of the packaging, in such a way, that it does not damage the original product or the packaging. You have a statutory duty to take care of the goods. Damage or distress caused or allowed by you to the product may void your right to return the product. You are responsible for the cost of sending back the goods. They should also be insured in case the goods are damaged during return transit. If the product is damaged in return transit, if insured, you will be able to put in a claim for reimbursement through the carrier. We can provide any images or information that you require to process your claim. Please note transportation costs may apply. Nearly all our orders arrive on time and in the same excellent condition they left our warehouse. For large items delivered by a 2-man carrier service, the driver will help you unpackage the goods and wait whilst you check them. Please do take advantage of this service so any defects can be reported immediately and the goods taken away and exchanged for a quick resolution. If you do not intend to use your goods immediately, please open and inspect them before storing. NOTE: Please do not try to fit a damaged item/appliance without calling us for advice first. Faulty Goods On rare occasions products may develop a fault. Our policy for dealing with faulty goods is intended to ensure you get the fastest resolution possible and minimize the time you are without a working item. The policy for dealing with faulty items differs depending on the product type and when the fault developed. Nothing in these terms will affect your legal rights. Ireland, Isles of man, Isle of Wight & Scilly Isles. Shetland Islands and postal code areas AB37-38 AB41-56 TR25 TR21 IM BT ZE PH50 PH49 PH30-44 PH17-26 PA60-78 PA20-49 KW IV HS KA27-28. The item "SIA 75cm 5 Zone Black Touch Control Ceramic Hob In Black 99Min Timer" is in sale since Thursday, May 24, 2018. This item is in the category "Home, Furniture & DIY\Appliances\Cookers, Ovens & Hobs\Hobs". The seller is "shipitappliances10" and is located in GB.